Pressed from the rind, grapefruit is more than just a fresh scent, its cleansing and invigorating properties have made it a favorite among essential oil lovers. 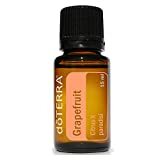 Grapefruit’s fresh, invigorating aroma is sure to uplift the mood and please the senses. For topical, aromatic, or dietary use.